In preparation for the feast of our Beata, let's start today to transcribe the penultimate chapter of For Love Alone! by Eugenia Signorile. It will be undoubtedly a nice wellspring for meditation. Let’s fix ourselves this time on her growing physical sufferings. If we take an overall look at the last decade of Alexandrina’s life, we see that the martyrdom of the victim increases continually, with sufferings of all kinds. This statement aptly defines the path her life was taking during this period. Sufferings were invading her whole person, as much in the physical sphere as in the spiritual. We will look at each separately – even if they are not, in essence, separable – because one influences the other. From the end of 1944 she started to feel that the eyes suffer with the light. Fr Umberto offered her dark curtains to cover the window. In 1945 she alludes to this torment repeatedly. My daughter, my spouse, listen: I am leading you. Your suffering will increase: the eyes of your body will be always as if light did not exist. (...) to poor nature everything is repugnant: even now not being able to reach to see the light makes my room into a dark dungeon. My need of air and not being able to reach to see the light seems to take me almost to the point of desperation. - My daughter, on the morning of Easter Sunday you will see not complete light, but a half-light. I will be the strength of your eyes. I said many times to Jesus: I want to give all to You, all until the last drop of my blood for your divine love and for the rescue of sinners, just as You have given yours for me. But I did not think that Jesus took things so seriously! To speak has become a great sacrifice for you, but do not be afraid, because your life of love, your life for the good of souls will continue in your looks, smiles and sweetness until the last instant. Only Heaven sees, it alone can evaluate my sacrifice. I cannot speak: at each word that I pronounce it seems as if a jet of blood spurts to my lips. It is only for the love of Jesus and of souls that I make so great a sacrifice. To obey (Fr Umberto had ordered to her to go on dictating the diary and to send it to him in Italy) when and if we can, does not cost, but when it is achieved by such unutterable suffering, it is an unheard of sacrifice! The pains of the body are so colossal, and those of the soul measure themselves by them. O Heaven, O Heaven, O life without life! S (15-10-54). Her heroism in sacrifice will continue for almost eleven months: the last diary entry carries the date, 2nd September 1955! By the end of 1946 the joints of the arms and the vertebrae had dislocated themselves! 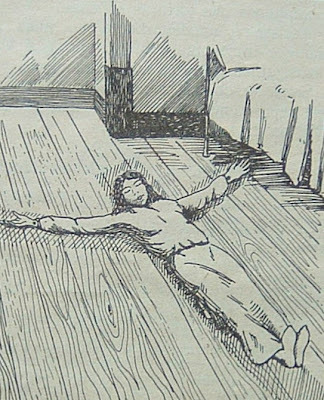 Dr. Azevedo decided to intervene: he prepared two supports in the form of an elongated S, that he attached to the sides of the bed’s headboards; he tightly wrapped Alexandrina’s arms and bound them on these supports in such a way that they held her by passing under her arm-pits. Moreover he placed hard boards under her mattress and wrapped her whole body around them. Alexandrina was to remain like this for nine long years until her death. This happened exactly on 3rd October, the anniversary of her first crucifixion. (This anniversary day,) without reflecting or linking anything, also happens to be the date on which my poor body, swaddled, was placed on hard boards. This bed became her bed of thorns. On top of this she was frequently in a fever, which gave her the sensation of having her flesh destroyed. My poor body continues to be a skeleton: skull, wounds, thorns, arrows, pain and blood, sometimes this one, sometimes that. Of course, insomnia doesn’t fail to follow! 9:15 - Lecture by Fr Dario Pedroso on "Alexandrina and the Year of Faith." 19.00 - Movie "Alexandrina lives the Passion." The celebrations will be transmitted on the Foundation of Blessed Alexandrina website. In Heaven I'll be as the poor blind man by the roadside, hand outstretched, begging for alms. Mary's Dowry Productions have a new DVD with short films, each of 10 minutes, on six Blesseds. It is entitled: Well Known Blesseds Volume One. 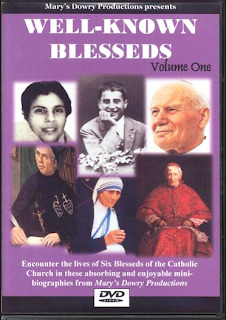 Each short film tells the life of a particular Blessed and volume one focuses on the lives of Blessed John Henry Newman, Blessed Mother Teresa, Blessed Pier Giorgio Frassati, Blessed John Paul II, Blessed Alexandrina Maria da Costa and Blessed Dominic Barberi. The short filme on Alexandrina "is a small overview and we deliberately put it on with a lot of popular saints so as to get people who are interested in them to find out about her too. It's a completely differente production to the other DVD we have as it's only 10 minutes" (Mary's Dowry Productions). Although on this list above our Beata comes in second to last, she is the first in the DVD package. Her popularity is growing in the Anglo-Saxon world. See the List of Catholic films availabe from Mary's Dowry, titles and lenghts of DVDs. Find here divulgation on previous DVD: 1, 2, 3, 4, 5. Through you the world was consecrated to my Blessed Mother. The Decree of the Bld Alexandrina’s Heroic Virtues states that “in the year 1936, (Bld Alexandrina) asked the Pope the Consecration of the world to the Immaculate Heart of Mary, which Pius XII made on 31st October 1942”. Let’s see in a short overview the way that took to it. “My beloved Jesus told me that He would be my Director and my continuous, frequent, usual Master and your Reverence there by far; but that I had to obey to you first and then than to Him. He also told me to tell your Reverence that my pilgrimage on earth would not last long, but that great things awaited me”. “I will do great things through you”. “My daughter, I require you to tell your spiritual father that, in proof of the love that you bear for my most Holy Mother, I want an act of Consecration of the entire world to be made every year, on one of the days of her feasts, chosen by you – the Assumption, Purification or Annunciation – asking that the Virgin without stain of sin to shame and confound the impure ones, so that they return to the to the true path and cease to offend Me”. Like I asked Holy Margaret Mary to be the world consecrated to my Divine Heart, so I ask you to be it consecrated to Her with a solemn feast”. Fr Marian Pinho, Alexandrina’s first Spiritual Director, was at that time a remarkable Jesuit, who had embraced the task of promulgate in the country the Eucharistic Crusade for Children, for which he created a successful magazine, who collaborated in other magazine, the Messenger of the Sacred Heart, and more, who directed the main Jesuit magazine, Brotéria. His name was known all over the Portugal. But the task he then received from Jesus was not a common one. From now on begin the several diligences: letters to the Holy Father, examinations by ecclesiastical order and so on. 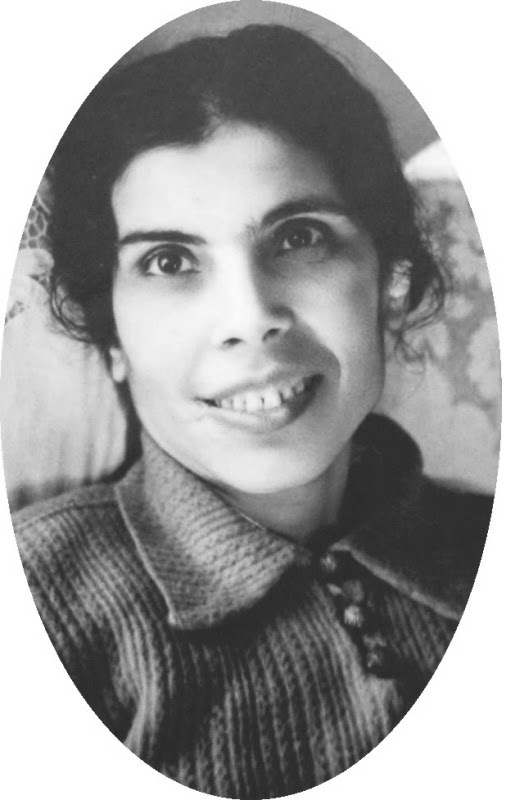 In 1938, Jesus gives a proof, his Passion physically relived by Alexandrina. This suffering stops as soon the consecration is made. “I want penance and prayer to be made. It is you who are shortening the divine justice and you must suffer this until he consecrates it (the world)”. “My daughter, ask the Holy Father to have compassion for your martyrdom (the Passion) and satisfy the divine desires of Jesus, which is to consecrate the world to my Blessed Mother”. This way of reliving the Passion stopped after the consecration. Bld Alexandrina reliving the Passion. Painting contemporary of the event. “I’ll say you as will be made the consecration of the world to the Mother of the men and my Blessed Mother. I love her so much! “If he wants that the world to be saved, that he rushes the hour of its Consecration to my Blessed Mother. That he places her in front of the battle and that proclaims her Queen of the Victory and the Messenger of the Peace”. Here she is declared not Lady but Queen. But the title Lady of the Victory will come again. In the prayer of the consecration Pope Pius XII used the title “Victress of all God’s battles” which, according Fr Marian Pinho, corresponds to Lady of the Victory. “Glory, glory, glory to Jesus! Honour, honour and glory to Mary! The heart of the Pope, the golden heart has decided to consecrate the world to the Heart of Mary! What great happiness and joy to the world, to belong more than ever to the Mother of Jesus! The whole world belongs to the divine Heart of Jesus; everything will belong to the Immaculate Heart of Mary”. “Hail Mary, Mother of Jesus! Honour, glory, triumph to your Immaculate Heart! Hail Mary, Mother of Jesus, Mother of the whole Universe! Who will not want to belong to the Mother of Jesus, the owner of the Victory? The whole world is going to be consecrated to her maternal Heart! “The Heaven, the Heaven full of glory! The Heaven full of triumph! A lovely crown, more beautiful than the sun and the stars is prepared for the crazy one of Jesus. Jesus is everything for His crucified one. On 31st October, at the conclusion of the Fatima jubilee (25th anniversary of the apparitions of Our Lady in Fatima, in 1917), the whole world could listen, on the radio, the voice of the Holy Father consecrating the world to the Immaculate Heart of Mary in Portuguese! As far as we can see, even the Catholic Authorities didn’t expect the Consecration. The following day newspapers ignore it. All attention was concentrated on the Jubilee of the Apparitions and it was an honour for the country to hear the Pope speaking Portuguese… Besides, we must remember that Portugal was not in war. Only after some days did people begin to pay attention to the final words of the papal speech where the Act of the Consecration had been referred. not through our own merits, but solely through the great goodness of thy maternal Heart. consumed in a fire of hate, victim of its own wickedness. and above all provide for us those graces which prepare for, establish, and assure peace. pray for us and give to the world now at war the peace for which all people are longing, peace in the truth, justice, and charity of Christ. that in the tranquillity of order the kingdom of God may prevail. bring them back to the one fold of Christ under the one true Shepherd. so that the servants of God may increase in merit and in numbers. where alone they can find truth, life and peace”. “When I learned about the consecration of the world to our beloved heavenly Mother in a telegram, Jesus allowed me to have some passing moments of consolation. “Be happy, beloved daughter, be happy dear daughter, because the desires of Jesus are realized! “If he (the Pope) wants the world to be saved, that he rushes the hour of its Consecration to my Blessed Mother. That he places in front of the battle and that proclaims her Queen of the Victory and the Messenger of the Peace”. “Before Alamein we never had a victory. After Alamein we never had a defeat”. Through you (Alexandrina) the world was consecrated to my Blessed Mother. “The noted Mariologist Gabriel Roschini called the 1942 consecration of the human race to the Immaculate Heart of Mary the greatest honor, which anyone can imagine. It is the highest manifestation of the Marian cult. It opens new perspectives for salvation history”. When might it be possible a monument be erected in Balasar to commemorate such a great event? Translation into English by Assunção Gomes. PINHO, P.e Mariano, No Calvário de Balasar, (second edition), Apostolado da Oração, Braga, 2005. In the Fr. Marian Pinho’s letter to Cardinal Pacelli, on 11th September 1936, the author informs: Agitur enim de impetrando Summo Pontifice, ut in tantis rerum discriminibus et angustiis, mundus totus Reginae Coeli et Terrae ac Dominae a Victoria consecretur. “It is the case of asking the Roman Pontiff to consecrate, in a moment of so many difficulties, the entire world to the Queen of the Heaven and of the Earth and to the Lady of the Victory”. This anniversary was commemorated in Lisbon, because there was still no Basilica in Fatima.